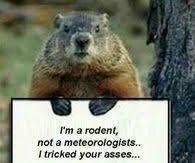 With Groundhog Day tomorrow, here are a few light-hearted, post-polar vortex thoughts from Northwest Lower Michigan. Please feel free to pass along your fun quips too and they will be added. …20 degrees fahrenheit feels like a frigging heat wave. …you regain your appetite for ice cream. …you no longer have to wear gloves to get the mail. …sitting near the window in the warm sunlight is no longer a religious experience. …schools are open for the first time in a week…or more. …you no longer have to wear thermal pants or long winter underwear. …you’re sick of eating soup or chili. …you see your driveway or the street pavement for the first time in weeks. …you see people wearing shorts outside even though it is not quite 20 F.
…you can actually enjoy the snow. …your power bill has four digits…all to the left of the decimal point. …your snow shovel and snowblower demand a vacation. …Billings, Montana sounds like a warm place to escape the cold. …you promise to boil, bake, stir-fry, or fricassee eff’ing groundhogs to eat, for the rest of the damn season, if Punxsutawney Phil predicts six more weeks of more winter tomorrow! This entry was posted in Animals, environment, fun, weather and tagged climate, polar vortex, winter. Bookmark the permalink.